Sr.Rani Maria was born on 29 January 1954 as the second child of Paily and Eliswa Vattalil,Pulluvazhy, Kerala in an ordinary peasant family. The family was blessed with seven children - two boys and five girls. Her Brothers and Sisters are Steephen, Annie, Varghese, Thressiamma, Celine (Sr.Selmy Paul FCC) and Lucy. Her Baptism was on 5th February 1954 at St.Thomas Syrian Roman Catholic Church Pulluvazhy, Ernakulam Archdiocese, and Kerala. The early childhood of MaryKunju spent at the house of her maternal grandparents. The grandmother used to take her to the Church every day and taught her to pray in silence to Jesus. The God fearing parents brought her up in Christian faith and charity along with their six other children. "When MaryKunju began to utter the first syllables, her pious mother Eliswa, taught her to pronounce the name of Jesus, which she invoked in the final moments of agony at the hands of her assassins." She received the first Holy Communion at the age of seven in 1961. At the age of twelve on 30 April 1966, she received the Sacrament of Confirmation. She grew up in faith with the strong background of prayer and other devotional practices. She was very regular for the Catechism classes.She used to express her love and concern to the poor, servants and neighbours. She was happy to spend time with them. For her, it was a matter of joy to be with them, to work with them and to eat with them. As she received the seeds of faith from her parents, she was growing in Christian virtues like love, forgiveness and compassion. The lessons of real Christian life she learned from her parents and elders.She passed the S.S.L.C Examination with high marks. From childhood onwards she had an ardent desire to become a religious. 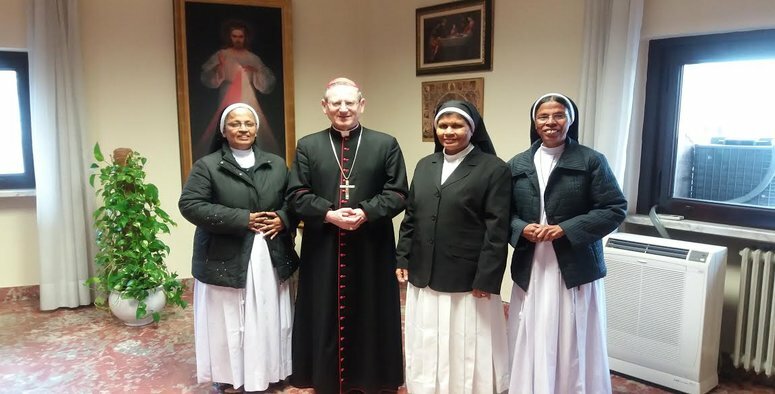 The close association with the sisters of Franciscan Clarist congregation (FCC) at Pulluvazhy convent gave a thrust to foster her religious vocation. Her mother Eliswa was a member of the Secular Franciscan Third Order. Along with her she used to participate in the weekly prayer meetings conducted at the convent. All these favourable situations enabled her to make discernment about her vocation. Though there were oppositions to embrace religious life, she was fully convinced of her vocation. The Word of God was echoing in her ears. Thus she went ahead courageously and took the decision to dedicate herself fully and totally for the service of God and His people. On 3 July 1972 Marykunju and her friend Cicily reached the Franciscan Clarist Convent Kidangoor of S.H. Province Ernakulam. Relatives and friends too accompanied them. When they bid her bye, feeling sad they began to cry "Why are you all sad? Said MaryKunju, We are here for a definite goal. Don't worry about us, but only pray that we may do well". The formation period of Mary Vattalil started with the aspirancy of four months on 3 July 1972. It lasted up to 1 November 1972. Sr. Gladys was the mistress.Fr. Thomas Karedan, a well experienced spiritual director also played a key role in her formation. His contribution in the spiritual direction and classes played an important role in the discernment of the vocation of the candidates. Mary also was fortunate to receive much spiritual power under his guidance to dedicate herself at the service of Jesus in the poorest of the poor. On 1 November 1972 Mary entered into the postulancy. Sr. Gladys continued as the mistress in Postulancy also. Six months of Postulancy lasted up to 30 April 1973. 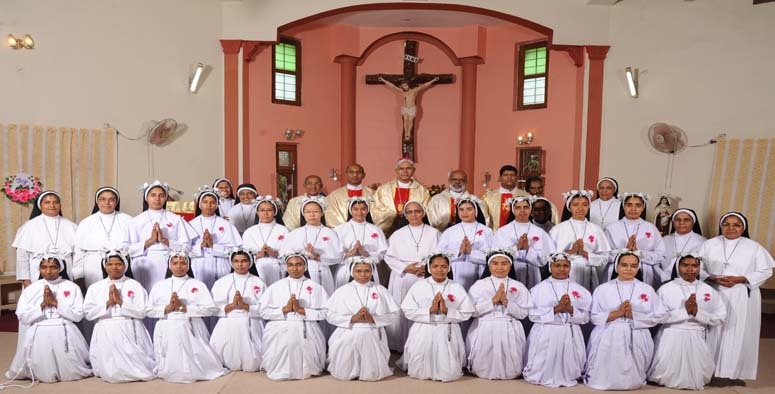 On1May 1973Mary along with 15 batch mates entered into the Novitiate.They dressed in white habits moved in procession towards the chapel at Kidangoor to begin their novitiate. After the prayer, Sr. Infant Mary, Novice Mistress, handed them their white veil, a symbol of their life in the Novitiate. During the novitiate she had to face trials and tribulations due to some physical illness. The novices have finished their preparation for the Vestition and first profession. 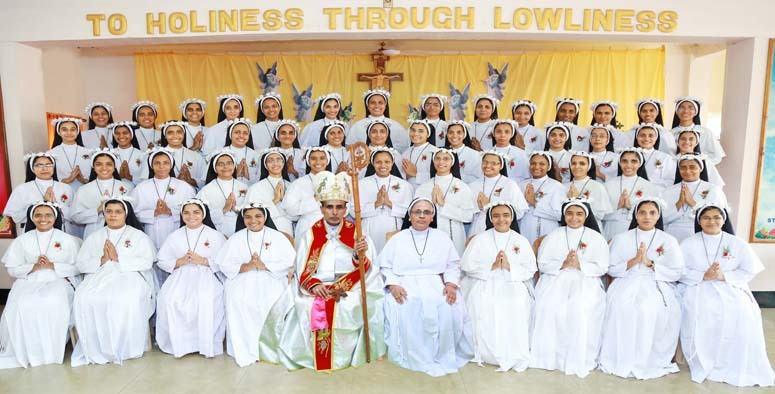 On1 May 1974 Mary along with 15 companions made the first Profession and received the religious habit at St. Hormis Church, Angamaly. Mary got the new name Sr. Rani Maria. The vestition ceremony was presided over by His Excellency Rt. Rev. Bishop Sebastian Mankuzhikary. After the first profession, they were sent to the generalate for Juniorate of six months.Sr. Rani Maria also reached there on 1 June 1974 at Generalate known as Portiuncula. Mother Maurus, the first Superior General of unified FCC was the then Superior General. Sr. Columbina was in charge of courses. With full of zeal and enthusiasm Sr. Rani Maria started her mission journey towards Bijnor on 9 July 1975. For her it was the fulfilment of a long cherished dream. To prepare her first, she was sent along with Sr. Ann John to frequent the language study and mission orientation course from 9 July to 24 December 1975 at Navajoythi Pastoral Centre, Patna Bihar. She attended the course, staying in the Provincial House of the Sisters of Notre Dame, Patna. On completion of the language study programme, she was gone directly to St. Mary's Convent, Bijnor. But against her desire, she was appointed as a teacher in St. Mary's English medium school. As she was deeply convinced of her calling to work for the poor, nothing could prevent her from her mission. Fr. Varghese Kottoor CMI, the manager of the school could understand her heartfelt desire. After the duties in the school she found time to go to the village. Sisters in turn used to accompany her for the village visit. However after two years of teaching (197 6-78) she was fully relieved from the teaching. Thus she could spent time fully in the village apostolate. In the village she organized the people and started some developmental activities. She used to say that she was born and brought up as a missionary at Bijnor. Sr. Rani Maria in her own initiative invented many ways and means to get involved in the lives of the poor people in several villages. First of all her attention reached to the nonschool -going children. She started the open air schools and attracted the children to the school, by distributing sweets, toys and holy pictures. Later these schools gave way to start several non-formal schools for the poor and marginalized children. She tried to make them literate and more human. Afterwards the open air school shifted to the newly constructed school buildings, and teachers were assigned to teach in a regular way to the children. Besides the reading and writing, children learned handicrafts and hygienic way of life there in the school. Under the leadership of Sr. Rani Maria many balawadis (nurseries) and adult literacy centres started. Thus she could raise the overall standard of living of the villagers. Villagers became happy about all these activities and developments. To be competent in the mission field she did her higher studies in sociology along with her apostolic activities in the villages. Her faith in the Lord, Spirit of prayer, commitment to the cause of the poor, hard work and courage to face the challenges was exceptional. There she was known as ‘Bijnor Rani'. In some villagers used to call her "Indira Gandhi of the villagers". She made her final commitment to the Lord on 22, May 1980. Rt. Rev. Dr. Sebastian Mankuzhikary, presided over the function. In his homily he challenged them saying, "The blood of martyrs is the seed of the Church and there could be sisters among these who are ready to become martyrs." After 15 years, his Prophecy became realised.Along with her developmental activities, she also did her best to satiate their spiritual hunger. She got deeply involved in catechetical work and evangelization. She conveyed the message of the parables of the Prodigal Son, the Good Samaritan, and the dialogue of Jesus with the Samaritan woman. She also made use of other Biblical narratives to evangelize through puppet shows. Prayer groups also helped the poor to raise their hearts to God. She realized that Gospel has to be proclaimed to everybody.On 25 May 1983, Sr.Rani Maria arrived at Assisi Sadan convent Odagady. On18 May 1992 Sr. Rani Maria arrived at Udainagar in the Diocese of Indore.The Community was so happy to welcome Sr. Rani Maria, an experienced and well- qualified social worker having 16 years of experience in Bijnor and Satna. She reached in Udainagar with reputation of being a very committed social worker, organizer and animator. With the help of the community members she made a thorough study of the place, people, and their socio economic situation. She formed village credit unions, seva samities, mahila mandals etc. Through these organizations she could get help from the government for many rural development schemes and also loans and subsidies from the banks for fertilizers, seeds and irrigation projects for the poor farmers. She extended the activities in and around Udainagar and made every effort to free the poor from the clutches of the exploiting money lenders. From 1991 to 1994 Sr. Rani Maria served the Province as the Provincial Social Service and Evangelization Department Consultant. In December 1994, she was elected as Provincial Councillor for Department of Social Service & Evangelization. On February 25, 1995, at the age of 41, the most tragic event in the history of Udainagar as well as of FCC took place. It was the brutal assassination of Rani Maria. On her way to Indore in a bus called ‘Kapil' she was brutally murdered in the daylight in front of the passengers.